Mercedes C Class review Review 2019 | What Car? These days, the Mercedes C Class has a seriously tough job on its hands. Not only are the brutes it has always battled with – the Audi A4 and BMW 3 Series – still digging at its ribs, but we mustn’t forget the Jaguar XE. But that’s not the end of it, because you have to also consider the Audi A3 Saloon and the cheaper versions of the BMW 5 Series, as well as the non-premium competitors that can offer more for less, the Volkswagen Passat and Skoda Superb being good examples. Before you’ve even considered the legion of SUVs that are currently gobbling up sales left right and centre, that’s a whole platoon of worthy rivals. However, the C Class fights back with an affordable mild hybrid alternative to diesel power. This uses a 1.5-litre petrol engine, badged C200, that is bolstered by the addition of not only a turbocharger but also a small electric motor. There are also more performance-orientated petrol engines and plenty of diesel options for high-mileage drivers. Just as important for those racking up those miles is a welcoming interior. Here the Mercedes scores by being that little bit more interesting to look at than its German rivals. Even entry-level models get a reasonable list of toys, but you can easily spend thousands more on plush leather upholstery, high-end stereos and more tech than you can shake a selfie stick at. In fact, with so many choices available to the buyer, speccing your C-Class can be a bit of a minefield. With that in mind, read on to find out all you need to know if you're considering a C Class, including which engine, trim and options to choose. And if you decide it’s the car for you, you can even buy one for the best price via our New Car Buying service. The C220d is our model of choice. 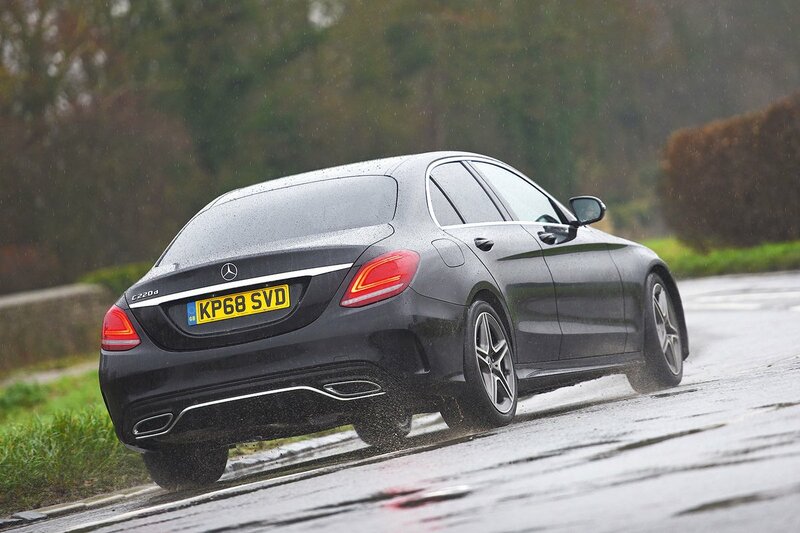 With the same 191bhp 2.0-litre diesel engine as is used in the larger E Class saloon, it offers plenty of low-down grunt and feels fast enough to hold its own against any of its chief rivals. It also comes as standard with a nine-speed automatic gearbox that, while occasionally slow to react, changes gear smoothly and crisply. There's also a more powerful 242bhp version of the same engine, badged C300d. As for the petrol options, we're yet to try either the entry-level C180 or the more powerful C300, while the mild hybrid C200 never really feels as fast as its power figures suggest. You really have to work it hard to extract what performance is available, especially on hills, and that isn’t always easy, because the auto 'box takes its time to kick down. Performance petrols are to be found in the AMG range. 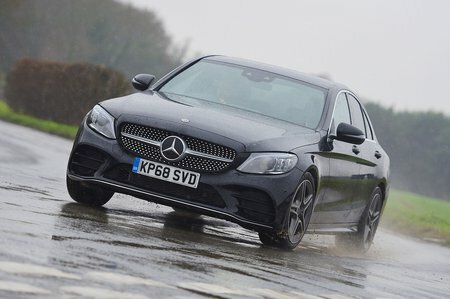 The C43 is rapid, with four-wheel drive traction helping out in the wet, and you can read about the bonkers C63 in our separate review. Mercedes’ new diesel-electric hybrid, the C300de, isn’t due to arrive in the UK until the middle of 2019, but we've already had a sneaky early drive that shows it should be a very compelling choice. You'll benefit from the superior long-distance economy and low CO2 emissions that a diesel offers, while its 121bhp electric motor and 13.5kWh battery allow it to travel up to a claimed 30 miles on electricity alone, meaning it’ll be cheap and clean to run around town. With both power sources working together, the C300de pulls strongly and flexibly (0-62mph takes less than six seconds), and the electric motor provides instant punch off the line. Even on small wheels, the SE is still less comfortable than you might think. Urban potholes and lumps cause the C Class to fidget noticeably, and it feels a little uncontrolled over crests at higher speeds. Upgrade to 19in or larger wheels and it only gets worse, the C Class proving less comfortable than the equivalent A4. Alternatively, there’s an optional air suspension set-up, called Airmatic. This is a reasonably priced upgrade and does a good job of cushioning the worst imperfections at higher speeds, although the car still gets caught out over really sharped-edged pockmarks and can feel a touch floaty over high-speed crests. AMG models come with a sportier adaptive suspension set-up that’s comfortable enough when dialled back to its softest mode but feels decidedly stiff over potholed roads in its more aggressive modes. Of course, for performance models, this is what you’d expect. Despite being pretty firm, the conventionally sprung SE is far from the driver’s choice in this segment. While grip levels are high, there’s a surprising amount of body lean in corners and it never feels particularly keen to change direction in a hurry. A standard C Class certainly isn't a car you’ll want to take down your favourite road for the hell of it. With the Airmatic suspension fitted, the C Class is pretty good to drive. Flick it into Sport mode and the suspension sharpens up noticeably, giving strong enough body control for you to hustle the car along a twisty road at a fair old lick but without making the ride so brittle that the car is knocked off your chosen line by mid-corner bumps. That said, it isn’t as much fun as the 3 Series or Jaguar XE down a twisty country lane; while the steering is direct and responsive, its weighting is a little inconsistent and it doesn’t involve you in the experience as much as it could. With its stiffer suspension and quicker steering, the C43 feels even more alert when cornering, and four-wheel drive makes its performance usable whatever the weather, but still isn’t particularly exciting. This is the area where the C200 really disappoints. Even when you’re cruising along, the engine transmits a noticeable hum and even a little vibration into the car. Accelerate hard and the engine gets even more vocal, interrupting conversations with passengers. The engine can switch off when you’re coasting but, as soon as it fires, the noise returns. 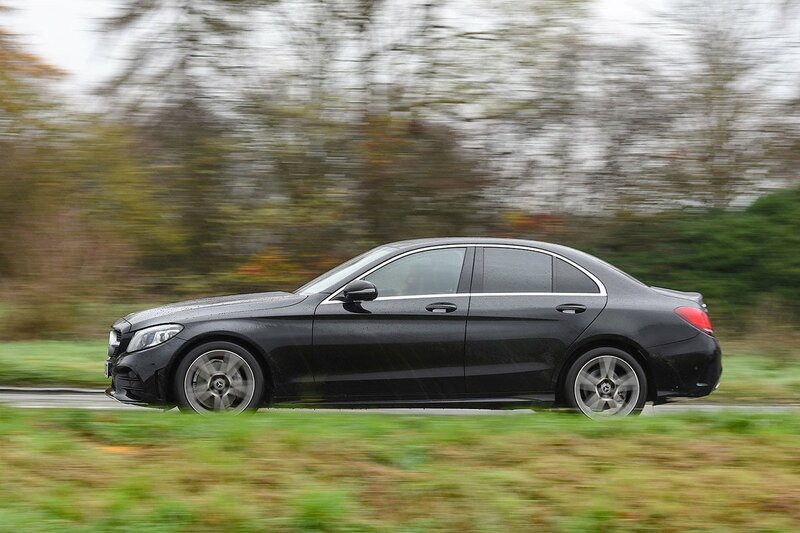 The C220d is better; in fact, when you’re coasting or cruising along, it’s whisper-quiet. But, again, ask it to do more than that and it grows somewhat gruffer, proving more intrusive than the Audi A4’s 2.0-litre diesel engine. A hybrid version badged C300de is also available and adds silent electric running. It’s smooth to switch between power sources, too. At least wind noise is very well controlled at higher speeds. Road noise is less impressive, with there being a noticeable hum over coarse road surfaces, even in cars on small wheels. Bigger wheels, stiffer suspension and a rorty exhaust make the AMGs the noisiest of the lot at a cruise, although that's part of the fun of a performance model.